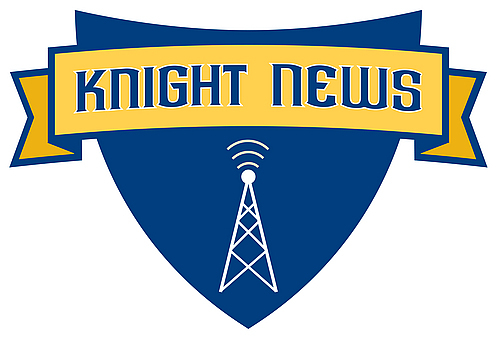 As the calendar prepares to flip to a new year, Knights Online looks back at some of the top storylines from the last 12 months. Our panel of judges painstakingly whittled down the nominees to select the top 18 of '18. We hope you enjoy this stroll down memory lane...and get excited about the prospects of what might happen in 2019. Happy New Year! 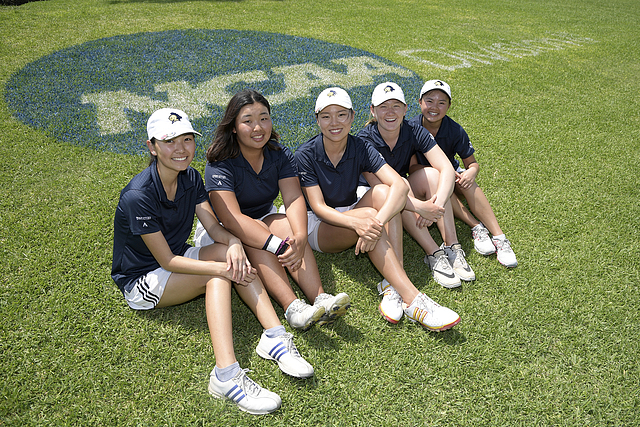 Following an undefeated regular season, the Carleton women’s golf team finished in sixth-place at the 2018 NCAA D-III Championships, tying the program record for best placement at the national tournament. Their performance marked the third time in the last four years that the Knights posted a top-10 result at the NCAA Championships. Ziyi Wang’s ’19 seventh-place finish was the highest ever for a Knight at the NCAA Championships. The women’s golf team continued its conference dominance with their second consecutive MIAC Championship this fall. The team did so in record-breaking fashion, smashing its own conference tournament 54-hole scoring record by 20 strokes, winning by a 66-shot margin, and claiming the top five individual finishers. For the team’s success, they are currently positioned No. 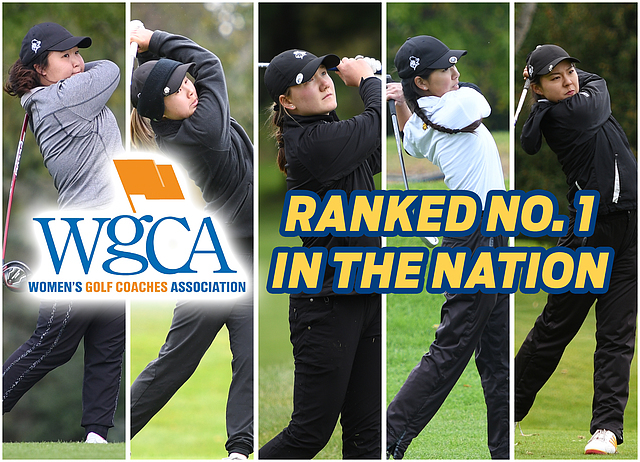 1 in the Women’s Golf Coaches Association D-III national rankings. 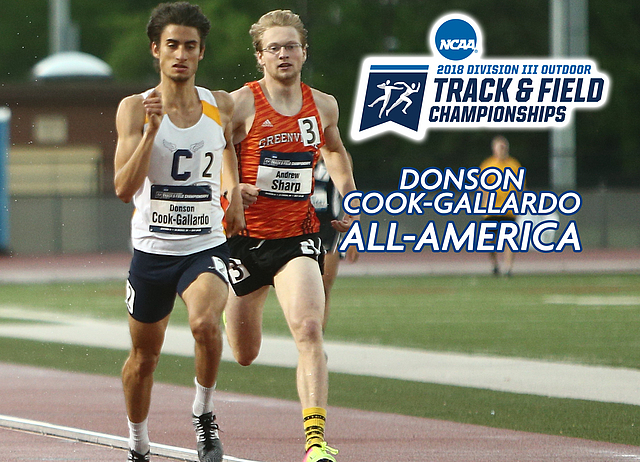 One of the most decorated athletes in Carleton College history, Donson Cook-Gallardo ’18 capped off his senior season with a second-place finish in the 800-meter run at the D-III NCAA Outdoor Championships. Cook-Gallardo, who was a seven-time All-American and a 12-time MIAC Champion, also was one of nine D-III male student-athletes to earn a prestigious NCAA Postgraduate Scholarship in 2018. The Carleton men’s soccer team posted one of the most successful seasons in team history during the fall of 2018. 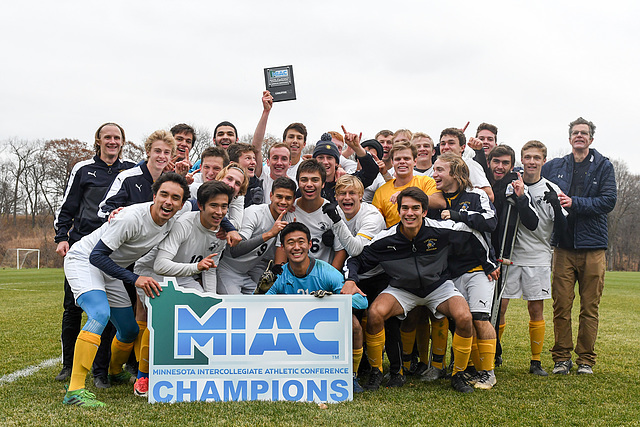 The year included a MIAC-record 12th consecutive trip to the conference’s postseason tournament, a thrilling penalty kick shootout victory in the MIAC Playoff Championships, a return to the second round of the NCAA Championships, and a 16-match unbeaten streak stretching nearly two months. 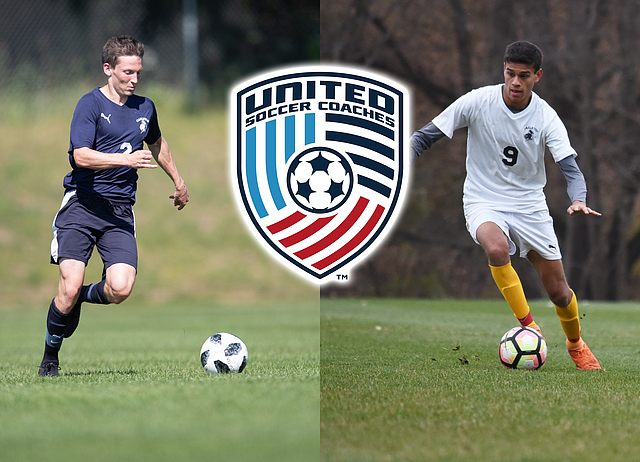 After a remarkable season for the Carleton men’s soccer program, senior defender Mark Roth ’19 and first-year forward Marco da Cunha ’22 were both voted to the United Soccer Coaches (USC) All-American team. Carleton was one of only seven programs across the country to have multiple players named All-Americans. 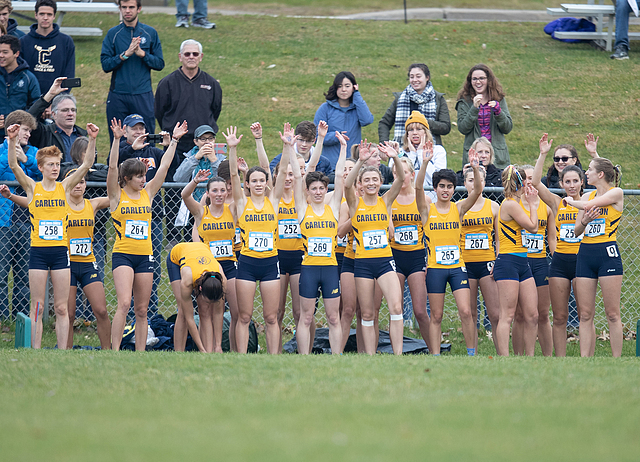 The women’s cross country team ran their way to a 10th-place finish at the NCAA D-III Cross Country Championships. The Knights strong finish to another excellent season marked the second consecutive year—and seventh time overall—that the runners have posted a top-10 result at the national meet. Kevin Grow ’18 was one of only 25 men’s basketball players from across the country to earn any level of All-America recognition from D3hoops.com. This came following a spectacular senior season, where he became the first player in recorded MIAC history to total 1,000 career points, 1,000 career rebounds, and 200 career blocks, Grow was also named one of 10 finalists for the 2018 Jostens Trophy—awarded to the top D-III men’s basketball player. In his rookie season with the maize and blue, Leo Vithoontien ’21 became the first men’s tennis player in nearly 30 years to earn All-America status after a stellar performance at the NCAA Championships. 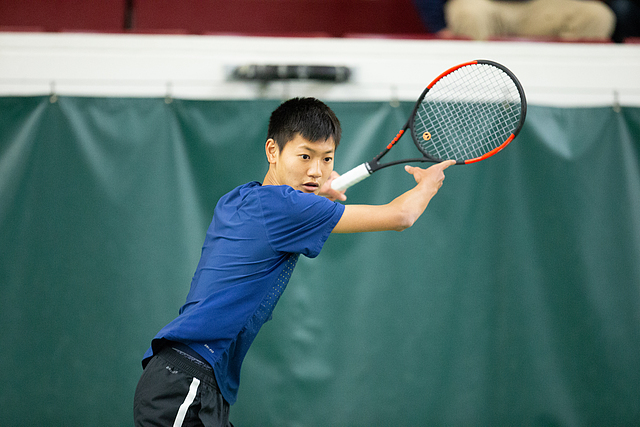 Vithoontien finished the season with a 20-2 record and helped the Knights claim second place at the MIAC Championships. 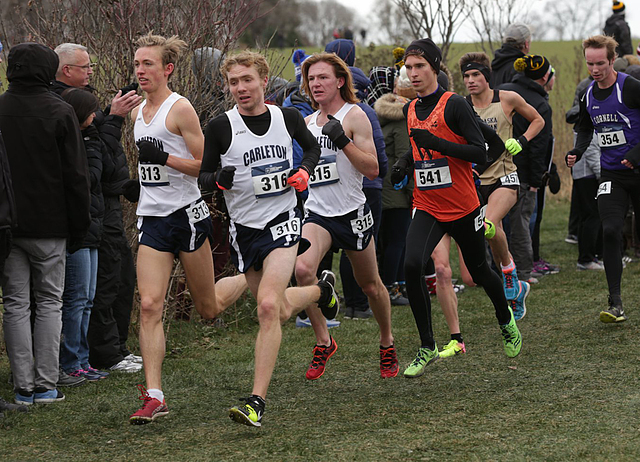 The Carleton men’s cross country team completed another season of dominance, finishing in 14th place at the D-III NCAA Championships despite a NASCAR-esque crash early in the race. Sophomore Lucas Mueller ’21 and Matt Wilkinson ’21 earned All-American honors for their performances. Carleton had 14 of its varsity athletic sports earn team academic awards during 2018. 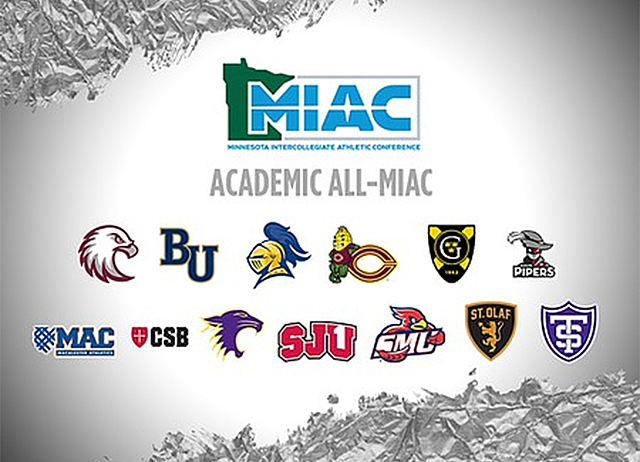 Aside from team academic success, 94 individual student-athletes earned Academic All-Conference Honorees from the MIAC. Additionally, 52 student-athletes earned other academic awards on the year. Football defensive lineman Matt Ganter ’19, men’s soccer defender Mark Roth ’19, men’s soccer defender Kamran Kelly ’20, women’s golfer Ziyi Wang ’19, and women’s soccer midfielder Ruby Kazemi ’19 were voted to prestigious Scholar or CoSIDA All-Region or All-American teams. Meanwhile, men’s soccer player David Rubin ’21 and women’s golfer Abby Euyang ’21 earned the MIAC’s Elite 22 Award for their respective sports. 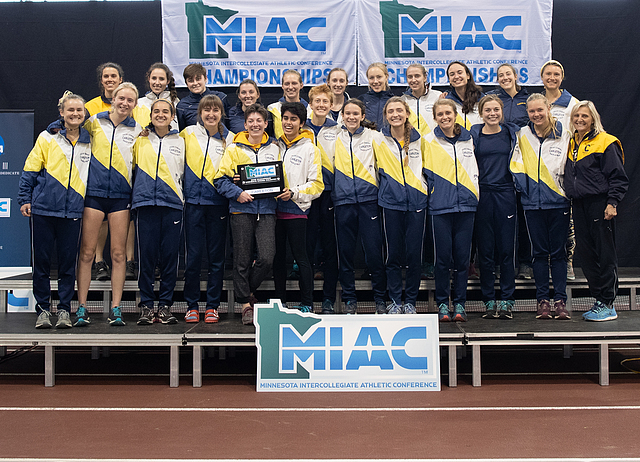 Thanks to six Knights placing among the top-12 runners, the women’s cross-country team claimed its second consecutive MIAC Championship this fall. Carleton has now won 7-of the last-10 conference crowns and 9-of the last 15. 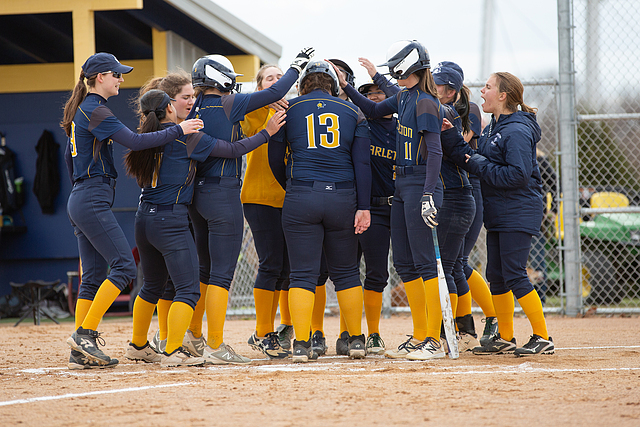 The Knights would then go on to win the NCAA Central Region Championship and clinch a team sport at nationals. 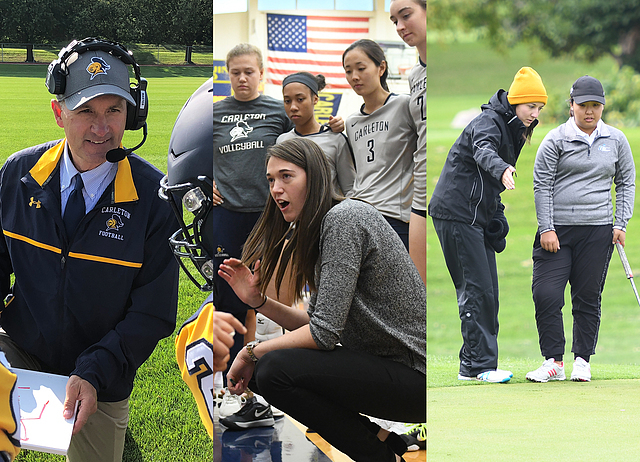 Head coach, Donna Ricks and her staff, were honored with the MIAC Women’s Cross Country Coach-of-the-Year and Central Region Coach-of-the-Year awards. 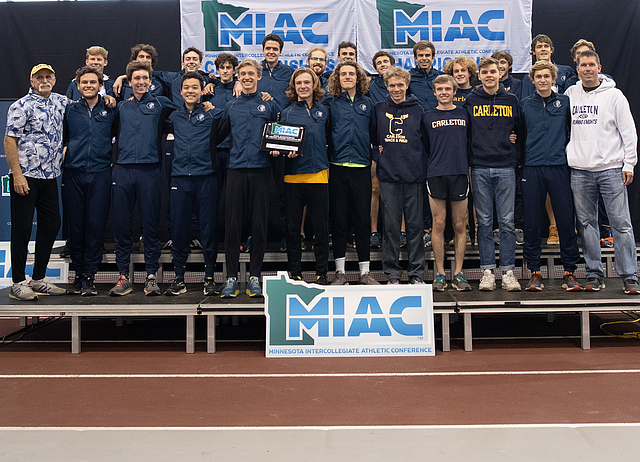 Lucas Mueller ’21, Tris Dodge ’19, and Cameron Meikle ’20 finished 1-2-3 as the Carleton men’s cross country team successfully defended its MIAC Championship title. The Knights placed all five scorers among the top 21 finishers and won their fifth overall conference crown. Head coach Dave Ricks was named MIAC Coach-of-the-Year and Mueller was named MIAC Men’s Cross Country Athlete-of-the-Year. The team’s second-place finish at the NCAA Central Region Championships garnered the squad a trip to Nationals, and Dodge was voted the Central Region Athlete-of-the-Year. 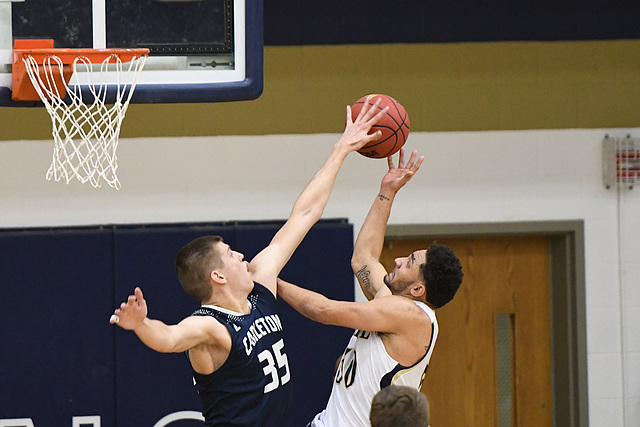 Christian Zaytoun ’19 wrapped up his collegiate career by earning All-MIAC honorable mention and stamping his name all over the Carleton record book. 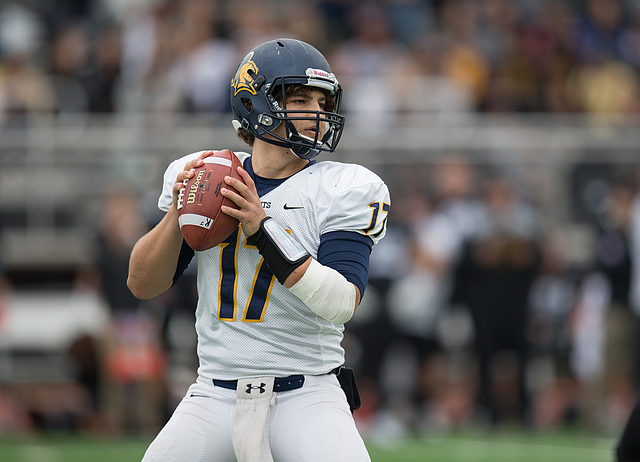 The senior quarterback helped lead the team to their most successful season in five years. Meanwhile, his 4,450 career passing yards and 40 career touchdown passes rank eighth and fourth in recorded program history. 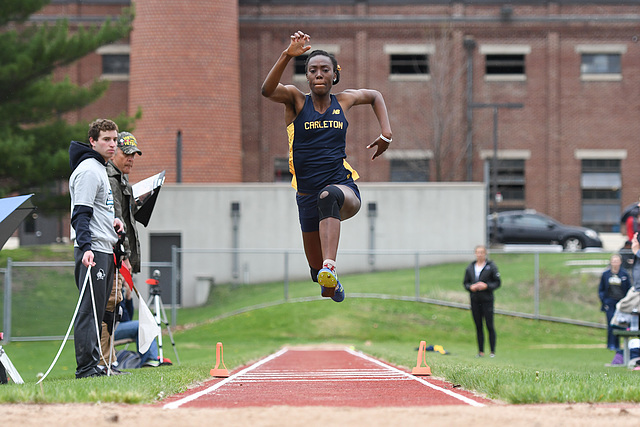 Damali Britton ’18 closed out her collegiate career by placing 14th in the triple jump at the NCAA D-III Outdoor Track and Field National Championships. The senior was a nine-time all-conference honoree in her time at Carleton and holds the school records for the indoor (11.29m) and outdoor (11.70m) triple jumps. Teammates Meg Mathison and Erica Blackett-Thomas ’21 both qualified for the NCAA Championships but injuries helped influence the decision to withhold them from the competition. 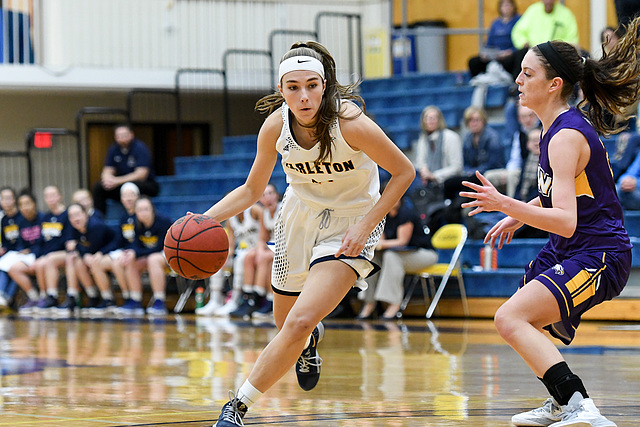 The Carleton women’s basketball team set a new team record for most points in a single game during its 98-93 overtime victory over the University of Dubuque earlier this winter. The 98-point performance from the Knights trumped the 16-year old program record by six points. Senior Cece Leone ’19 poured in a career-high 28 points—21 of them after halftime—to pace four Knights in double figures. The Carleton athletic department made three big coaching hires this year. In April, Tom Journell was named the 18th head football coach in program history. He led the Knights to their most successful season in five years and coached five All-Conference performers. Jacki Smith took over the volleyball program and guided the Knights to a winning record in her first season at the helm. The women’s golf team brought in Molly Erikson to be the third coach in program history. A two-time All-American golfer at St. Olaf, Erickson coached the team to a conference championship and a No. 1 WGCA ranking in her first half-season with the Knights. Carleton has already secured a return trip to the NCAA Championships in May. 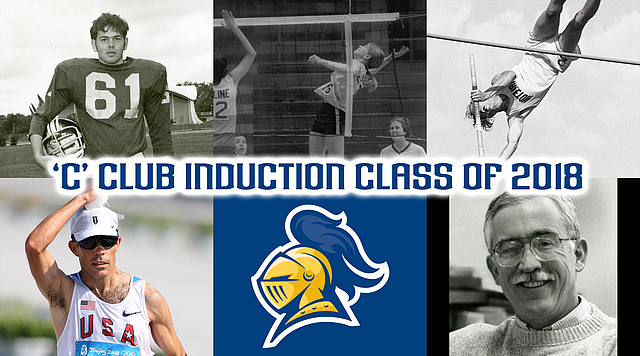 The ‘C’ Club Athletic Hall of Fame added five more members in 2018: football captain and NCAA Postgraduate Scholarship recipient Mark Williams ’73; tri-sport athlete Madeline McAfee ’78; All-American track and field athlete Jeff Brown ’88; three-time Olympian Philip Dunn ’93; and conference champion men’s tennis coach Robert “Bob” Bonner.